How does one prepare for a year-long bicycle ride? Another part of the preparations included picking the right contents for that shopping cart. Over the past few years I've put together and revised an equipment list for touring. Most things I already had from previous trips, but check over everything twice anyways. There really isn't that much difference in what one packs for a one-week trip as for a year. Fortunately, missing items can be purchased along the way and extra items can be mailed back. One of the larger purchases I made was for a new touring bicycle. I contacted Robert Beckman 10 months prior to departure and drove up to Bend, Oregon the prior Memorial Day to discuss details and close the deal. Plan was for me to pick up the bicycle over Thanksgiving, allowing some time for shorter shakedown trips. Unfortunately, Robert's frame builder had problems and bit by bit the delivery date stretched out...Christmas, mid-February...so that now, 9 days prior to departure, I still don't know whether I'll have a new bicycle to ride or will need to use my trusty Cannondale bike. The Cannondale is fixed up and will at least be a hot spare if not my primary steed. Last minute uncertainties concerning the new bike are a metaphor for the rest of the trip. No matter how much preparation one does, there will always be the unexpected as part of the adventure. Some of the preparation for the unexpected was in ~15 previous trips I've taken. I was also a voracious reader of books on cycling, long adventures on the road and other works. These included Cold Beer and Crocodiles about Roff Smith's trip also chronicled in National Geographic and Shimmering Spokes about Richard Allen's trip. I also read multiple web reports provided in the links page. In addition to preparing with previous trips, I also enrolled for a week of Bicycle Mechanic School. I had seen much of this previously, but for a double-thumbed mechanic it was a useful refresher as well as a good chance to take the Cannondale completely apart and put it back together. Unlike a homeless person, I'll have $ for motels, hostels and camping along the way. I made appropriate arrangements with ticket consolidators for airline flights; and with the India and Australia consulates for visas. I also set up the tech toys so as to provide communications from the road. Physically, I didn't do much preparation. Instead, plan is to take it a little easier the first few weeks to build up the stamina and ride into shape. One important thing will be not to push too hard too soon. Strain something in the first week and things will get less fun after that. Cannondale stock closes at 4 15/16ths. I've made 16% since I purchased at 4 1/4 in October. No signs of my new bike though. A reflection today about keys. 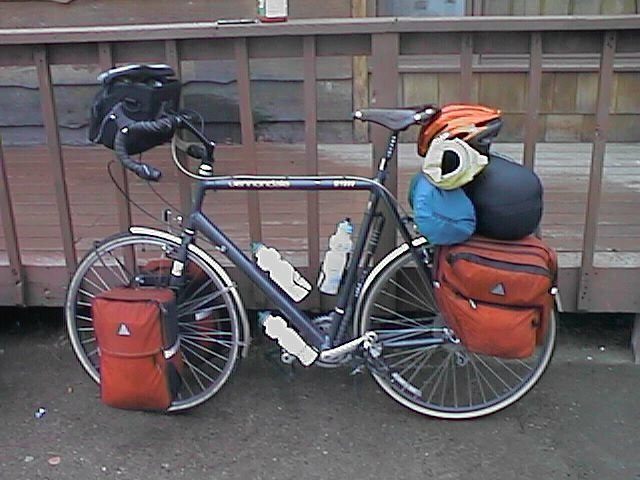 Prior to starting a bike tour, it always feels good to drop off the keys in the bottom of the pannier. I know I won't need those keys until the very end of the trip in getting back in my car or condo. These keys can symbolize the items with which they are associated. Dropping behind the keys leaves behind the associated items as well. While thinking about keys, I took a good look at my current key chain with keys I carry around each day and noticed that prior to this trip, I will give away most of them and not even need to carry them in the pannier. Eight keys total. One key was already gone, this one for the condo clubhouse since I had been on the board of directors. My term of office ended two weeks ago, and with it went the first key. Four keys associated with my condo. Two for the front door, one for the laundry room and one for my mailbox. Mailbox and laundry keys will go to my house sitter. Might not need to bring the other keys as well. One key for my car. Being sold this week, and with it goes the key. One key for the file cabinet at work. Everything in my cubicle is being packed up. With it, will remain the key for the files. This leaves just one key for the key chain...that to my bicycle lock. This I will take, but perhaps this is all I'll need. No new bike to start the trip. Its final, it wasn't possible to get the new bicycle completed and sent before my start date. Instead, I'll have it shipped to my parents in Colorado. I'll have it ready as hot standby and can also see what makes sense for swapping bicycles. Disappointing not to have the new bike to start the trip, but also nice to have that uncertainty removed. One sock weighs 38g. Have been busy weighing different gear to see what to take. Not that I am picking out my lightest socks :-). However the difference of 356g for 10" crescent wrench vs. 214g for 8" crescent wrench will make a difference. Do I need the extra leverage of the heavier wrench or can I save 100 grams here? Longer term, more of the weight coming off will be from my body, but shorter term trying to pick the right gear will help. Taxes filed. Car sold. Items to be mailed. Cleaning. Working to the last minute to condense an existence to a 10x12ft storage bedroom and pack for another existence on the road. Whirlwind of activity. So much to get done that hard to believe trip is really there. I suspect it may take a few days on the road before it really all hits. Expect the next update from there.